In a cosmic coincidence, two NASA spacecraft in orbit around distant planets in the solar system are expected to take photos of Earth tomorrow (July 19). On Friday, the Cassini spacecraft orbiting Saturn and the Messenger probe orbiting Mercury will train their cameras on Earth, capturing their unique perspectives on humanity's home in the universe. "What's important about this particular image is that it's the first time that we've known ahead of time that this picture was going to be taken," Mike Simmons, the founder and president of Astronomers Without Borders said of the Cassini photo. "It's an opportunity to bring awareness of our position in space to everyone, not just show a picture after the fact, but make people aware that there's a spacecraft out there that's doing it, and create an event that people will then want to look up, look at Saturn, learn more about it, and maybe even more importantly be involved in it, be a part of it." Scientists working with Messenger were inspired by the Cassini team's idea to take a photo of Earth. Coincidentally, they saw that Messenger would have a good view of Earth during planned observations aimed at finding natural satellites around Mercury, NASA officials said. The Messenger team will take its photos at 7:49 a.m., 8:38 a.m. and 9:41 a.m. EDT (1149, 1238 and 1341 GMT) on both July 19 and July 20. Cassini and Messenger will each capture different parts of the planet Earth in their images. Messenger will see the Middle East, Central Asia and Europe, while North America and part of the Atlantic Ocean will be in sunlight for Cassini's photo, NASA officials said. 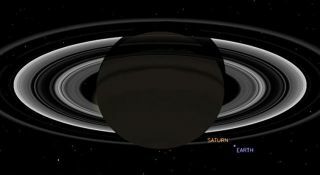 Astronomers Without Borders is calling on photographers of all kinds to send in their photos of Saturn in honor of the Cassini portrait session. Officials with the organization plan on crafting a "zoomable" mosaic image that uses photos of Saturn from Earth to craft a large duplicate of the Cassini picture. Both photos will take some time to process, but some of the raw images that will be arranged into a cohesive picture from Cassini's photo-snapping session with Earth should be available online as early as July 20.